My favorite sandwich hands down is the Reuben. I just can’t resist when I see it on a menu. And since so many people enjoy corned beef for St. Patrick’s Day, I thought it would be timely to post a Reuben Sandwich (I have a really special sauce I like to make for it.) Unfortunately, I forgot to buy bread at the grocery store so it’s soup instead (I’m sorry this is the third creamy, white soup in a row). 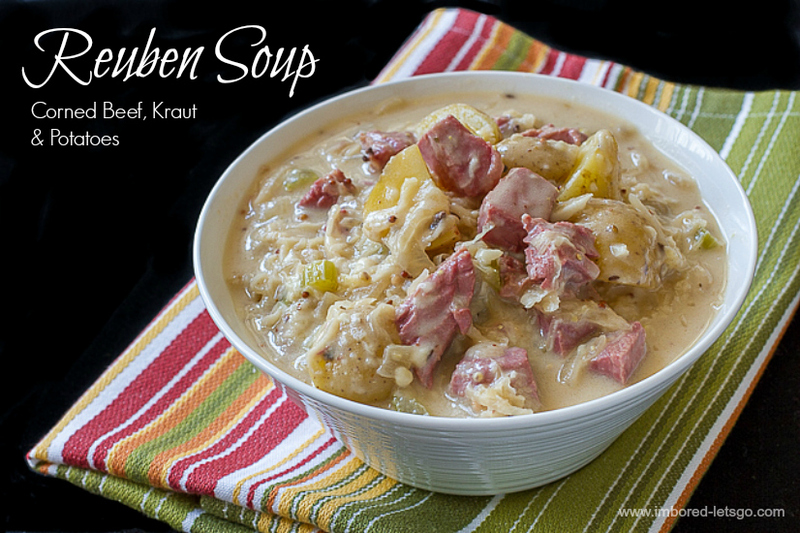 Inspired by my love for Reuben sandwiches, this Reuben Soup turned out to be quite a nice surprise. A hearty and tasty soup that’s perfect for your leftover corned beef! I had an idea in mind of how I was going to make this soup so did a quick search online to see if anyone else had made something similar or if I just had weird ideas. Well, duh, of course they had! Who knew? I somewhat followed a basic recipe from Allrecipes that had everything I planned on using, then changed some amounts and added a few more ingredients. As usual, I started by sautéing celery and onions in butter with some garlic. Then added some flour and beef broth, brought it to a boil, then tossed in the potatoes, sauerkraut, corned beef, and some caraway seeds and let it simmer until the potatoes were tender. To finish it I tossed in some swiss cheese and let it melt, then tasted it. Yummy, but I wanted just a bit more zing so I added a tablespoon of whole grain mustard. The recipe online called for 3 cups of half and half which I wasn’t planning to use but the soup was kind of a blah looking color so I added a half cup. Now all that’s missing was the rye or pumpernickel croutons (too bad I forgot the bread). You know what I think would be a good topper? A grilled swiss cheese sandwich on rye or pumpernickel cut up into croutons like I did with my roasted tomato soup! Give it a try…I hope you like it. Melt butter in large soup pot. Add onions, celery and garlic and sauté a few minutes until they start to soften. Stir in flour and cook until combined well. Stir in beef broth and bring to boil. Reduce heat to simmer. Add potatoes, corned beef, sauerkraut, caraway seeds. Cover and simmer 15-20 minutes, until potatoes are tender. Add mustard, cheese, and half and half. Stir to melt cheese and heat through. Try this for a topping: Make a grilled swiss cheese sandwich with rye or pumpernickel bread, cut up into bite sized croutons! Could you tell me what “half and half ” is please? Have never heard of this in Australia-or it may just be me!! This sounds delicious and I can’t wait to try it! I love your recipes-you’ve inspired me to cook again! Pleased your son is enjoying life in Australia. How nice, so glad you’re inspired to cook again! Now if we can just find someone else for the clean up, right? I’m so sorry I never measured it out when I made it, but it will certainly feed 4 for sure! How much garlic did you use? There’s no garlic in this recipe! I’m glad you enjoyed it. I missed having a Reuben (or this soup) this time around… always one of my favorites. Hope your daughter is enjoying Australia!